Could Nvidia’s upcoming Shield Tablet refresh feature its unannounced ‘Parker’ chip? Is Nvidia working on a new tablet? 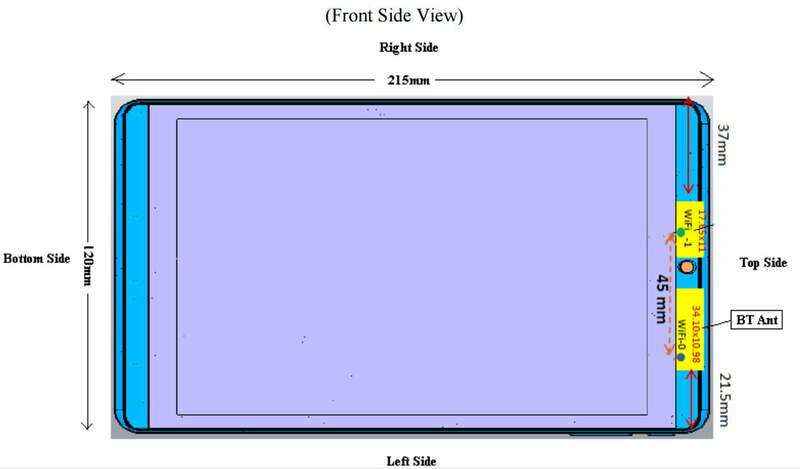 That seems to be the case in a listing on the FCC’s website, as a diagram can be found showing where the device’s wireless antennas are located within its chassis. Based on this diagram alone, we see that the tablet will support dual-band Wireless AC connectivity, Bluetooth, and Bluetooth Low Energy. We also see that the device will measure 8.58 (L) x 4.84 (W) x 0.31 (H) inches and weigh just over 12 ounces. The first Shield device released by Nvidia is now labeled as the Shield Portable, an Android-based handheld game console in the shape of a console controller. It was launched back in 2013, packed with a built-in folding 5-inch touchscreen, the company’s quad-core Tegra 4 chip clocked at 1.9GHz, 16GB of storage, 2GB of DDR3L memory, Bluetooth 3.0, and dual-band Wireless N connectivity. It sold for $200 and could connect to an HDTV via a built-in mini HDMI port. The company followed up with the Android-based Shield Tablet in 2014 sporting the quad-core Tegra K1 chip and an 8-inch screen with a 1,920 x 1,200 resolution. The tablet also consisted of 2GB of DDR3L memory, 16GB or 32GB of storage, a MicroSD card reader, a 5MP camera on the front and a 5MP camera on the back, dual-band Wireless N connectivity, Bluetooth 4.0, and a mini HDMI port. The tablet sold for a meatier $300. However, during the middle of 2015, Nvidia recalled Shield Tablets sold between July 2014 and July 2015. The reason for the recall was due to the tablet’s battery, which supposedly overheated and posed a fire hazard. The recall was initially voluntary, and Nvidia said it would replace the defective product free of charge. The tablet returned to the market in November 2015 as the Shield Tablet K1 with a smaller price of $200. However, the hardware components stayed the same, making it a great deal for consumers looking for a gaming tablet that’s not too bulky to hold. It’s compatible with Nvidia’s Shield controller, the company’s PC game streaming subscription service GeForce NOW ($8 per month), and the Shield DirectStylus 2. The tablet can be purchased directly from Nvidia, as well as from Amazon, Best Buy, B&H, and Newegg. That all said, a new tablet from Nvidia isn’t all that unexpected. After all, it’s 2016 and a refresh of the Shield Tablet platform is about due. The new version could possibly use the Tegra X1 processor that’s crammed into Shield TV, the company’s Android TV-based set-top box that launched last year, but that chip may be a bit outdated for a sparkly new tablet. Of course, Nvidia’s “Parker” mobile chip is slated to swing into the market sometime this year with “Denver” CPU cores and “Pascal” graphics cores. This chip will be based on TSMC’s 16 nanometer FinFET process technology, and will likely be the processor of choice along with the latest build of Google’s Android 6.0 Marshmallow. Given Nvidia’s track record, there’s a good chance we’ll see a new Shield Tablet model relatively soon. Nvidia hasn’t announced anything official, but there’s always Computex 2016 starting at the end of the month, so stay tuned.